Chlorophyll is a green pigment, present in all green plants and in cyanobacteria, responsible for the absorption of light to provide energy for photosynthesis. How is Chlorophyll Represented in the Ocean Tracks Map and Why is it Important? 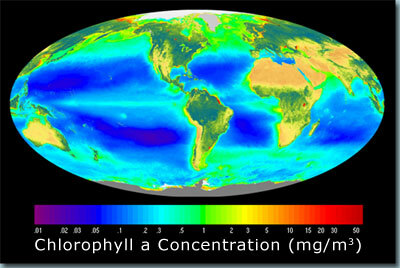 This map shows chlorophyll concentrations at the surface of the ocean. The ocean’s surface is filled with microscopic organisms called phytoplankton. Phytoplankton are primary producers that use pigments such as chlorophyll-a to photosynthesize. Measuring chlorophyll in the surface water is an indication of how much primary production is occurring in the surface of the ocean. Phytoplankton need nutrients such as oxygen, carbon, hydrogen, nitrogen, phosphorous, and iron for photosynthesis and growth (Segar 1998). Therefore, chlorophyll concentrations are highest where there are lots of nutrients. Phytoplankton also need light, which is only available in the upper 100-200m of the ocean, known as the photic zone. Organisms that live below the photic zone cannot photosynthesize, obtaining energy instead from food that sinks from surface water in the form of dead plankton and animals, and waste products from live organisms. Some organisms in the deep ocean below the photic zone generate energy using chemosynthesis, which is the process by which biological organisms mediate chemical reactions that generate energy. These reactions use chemicals present in the deep ocean to generate energy instead of using sunlight. Organisms in the deep recycle nutrients in food that has fallen from the overlying water as it is consumed, and return them to the surrounding waters, where they accumulate over time. This causes there to be high concentrations of nutrients in deep, cold water relative to warmer, surface waters, where nutrients are used up rapidly by phytoplankton. Currents and winds can bring water from the deep up to the surface during a process called upwelling. The nutrient rich water from the deep becomes available to photosynthetic organisms. This means that there is a correlation between water temperature and chlorophyll concentration. That is, cold water generally has higher chlorophyll concentrations than warm water because it contains nutrients that have recently come up from the deep ocean (Segar 1998, earthobservatory.nasa.gov). In the image below, you can see the cold, nutrient rich waters of the North Atlantic yield higher concentrations of chlorophyll and thus are more productive compared to the warmer, tropical waters that have a lesser chlorophyll concentration. How are chlorophyll concentrations measured? Satellites measure the color of the ocean as an indication of the amount of chlorophyll present. In the absence of chlorophyll, water appears blue. Chlorophyll has a green pigment, which means that it absorbs red and blue light and reflects green light. Satellites can measure subtle changes in ocean color, and can use the amount of green light reflected from the ocean’s surface to generate maps of global chlorophyll concentration (http://omp.gso.uri.edu). Scientists have estimated that the number of phytoplankton in 1 liter of seawater exceeds 1 billion individuals (Segar 1998). Zooplankton, which are tiny animals that drift in the water column, feed on phytoplankton. Zooplankton are then eaten by larger animals such as small fish and whales. These fish are then prey species for other marine animals such as squid, mammals, tunas, and sharks. 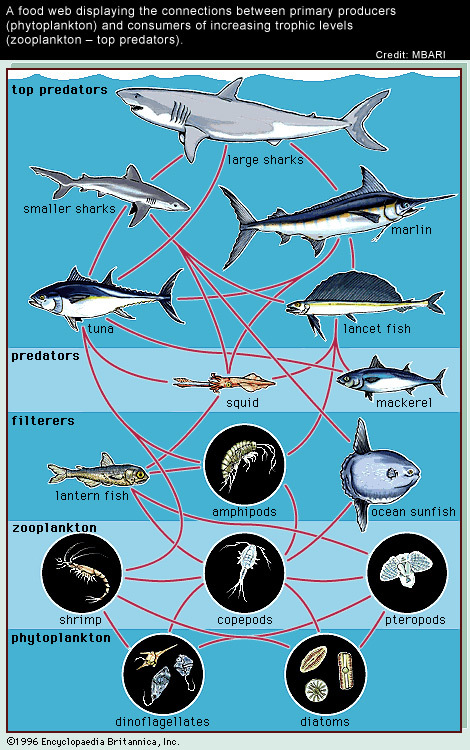 The image below shows how phytoplankton form the base of the food chain. Measuring the chlorophyll concentration therefore also indicates areas that are capable of supporting high numbers of marine animals because they are likely productive feeding grounds.